Some challenges have been met through research and technology development of techniques for dealing with spills. However, developing new technology can be a challenge in itself since many countries prohibit open-water equipment testing or response training with oil. Unlike smaller facilities that rely on scale models and oil surrogates, Ohmsett – The National Oil Spill Response Research & Renewable Energy Test Facility conducts testing, training and research with full scale equipment using real oil in repeatable simulated sea conditions. Ohmsett’s most notable feature is the above-ground concrete test tank measuring 667 feet long by 65 feet wide by 8 feet deep filled with 2.6 million gallons of crystal clear salt water. The facility is equipped with a wave generator, three movable bridges with tow speeds of up to 6 knots, an oil/water chemistry laboratory, and a control tower that is fully computerized for collecting data from various sensors and video cameras for synthesis and analysis. As the response industry demands more advanced and innovative oil spill technologies, BSEE has supported emerging technology development by funding multiple projects at Ohmsett. Most recently, research included a Geo-Referencing Identification tagging system equipped with a Wave Characterization Module, diminishing slick thickness tests, mechanical recovery of treated but undispersed oil, and remote sensing of oil slicks. The ability to remotely track wave conditions during skimming operations could give responders a better understanding of the environment in real-time and improve operations during a spill incident. In an effort to advance these tools, BSEE funded AECOM, of Gaithersburg, Maryland, to develop a Geo-Referencing Identification (GRID) tagging system equipped with a Wave Characterization Module (WCM). When mounted to a skimmer, the tagging system characterizes the motion of ocean waves, tracks the skimmer location, and transmits the information to the operators and to other personnel in remote locations. The AECOM team, led by Ben Schreib, evaluated the GRID system mounted to a skimmer in wave conditions in the Ohmsett test basin. AECOM and their subcontractors, Midstream and Envigia, also developed a free-floating WCM-buoy to calculate wave conditions. During the evaluation, the WCM and GRID tagging systems was attached to a commercially available skimmer and subjected to varying wave conditions, while two WCM-buoys identified wave height, wavelength and period. In order to collect comparative wave data, the two WCM buoys were operated separately in the same area as the skimmer. Through a mesh network over WiFi, AECOM was able to communicate the skimmer position and wave information to a tablet with a custom-made user interface application and via satellite to a web-based GIS interface platform. During actual oil spill response operations, it cannot be assumed that a skimmer will be recovering oil in a consistent slick thickness. In many cases, it is likely a skimmer would operate in a slick that decreases in thickness. In an effort to obtain basic research data on skimmer performance, BSEE conducted diminishing slick thickness tests on a weir and two oleophilic skimmers. The objective was to evaluate the performance of the skimmers for oil recovery rates and oil recovery efficiencies while recovering oil from incrementally thinner slicks. “It is important to understand how a skimmer’s performance is affected when operating as slick thickness diminishes,” says Kristi McKinney, BSEE engineer. In this test series, the Ohmsett staff used ASTM F2709 Standard Test Method for Determining a Measured Nameplate Recovery Rate of Stationary Oil Skimmer Systems, the standard for testing the performance of stationary skimmers in calm water conditions. The standard calls for testing as the slick thickness decreases from 3 to 2 inches of oil in order to create the ideal conditions necessary to measure a skimming system's maximum performance; however they incorporated various other oil slick thicknesses ranging from 2-inchs to 1/8-inch. According to McKinney, this series of experiments is the first of its kind and represents a continuation of basic research data associated with quantifying skimmer performance with varying test parameters. With the use of dispersants during response operations, there are claims that treated oil that has not dispersed can make traditional containment and recovery more challenging than untreated oil. In response to these comments, BSEE conducted research at Ohmsett to determine whether undispersed crude oil treated with varying amounts of dispersant affects mechanical containment and recovery operations. During the first phase of the project, two oleophilic skimmers, one with a smooth drum and the other with aluminum discs, were independently tested in controlled conditions. Using the ASTM F2709 as a guideline, comparative testing of untreated weathered crude oil and treated weathered crude oil was conducted to determine oil recovery rate and recovery efficiency. “Preliminary results do indicate that the performance of both skimmer types was affected by the presence of dispersants in the oil,” said McKinney. 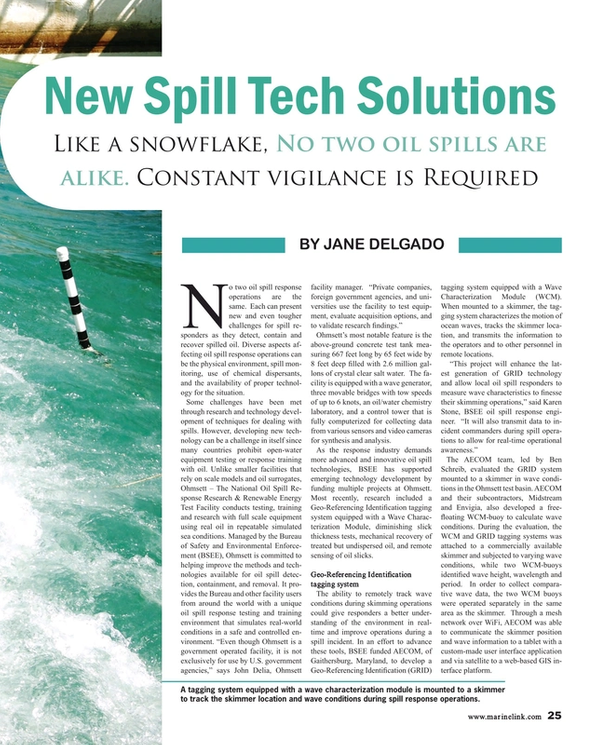 Remote sensing has changed the way the spill response industry has taken on the challenge of detecting, monitoring and measuring oil slicks. BSEE recently partnered with the National Oceanic and Atmospheric Administration (NOAA) to evaluate different remote sensing platforms used to assess oil spills. This included accurately monitoring and measuring the thickness of surface oil slicks. NOAA and BSEE conducted a study to gain a better understanding of the capabilities and limitations of several systems at Ohmsett. The focus of the project was on the identification of oil emulsions from aerial and satellite platforms with a variety of sensors, while simultaneously collecting in situ physical thickness and oil chemistry measurements in a controlled test environment. For the study, the Ohmsett staff created a large scale emulsified oil slick under natural but controlled conditions and maintained it throughout the evaluation. The emulsified oil in the tank was viewed from multiple angles and heights with remote sensor systems mounted to the main bridge, an unmanned aerial vehicle, fixed-winged aircraft, and a helicopter. In addition three satellites equipped with a variety of sensors were tasked to fly over the Ohmsett test tank to capture high resolution remote sensing data with the physical sampling in the evaluation of the emulsified oil slick. The study allowed the BSEE and NOAA team to gain a better understanding of sensor resolution and the impact of sensor altitude while characterizing surface oil emulsions. It also provided useful information to judge the most efficient remote sensing technologies and platforms for real-world response and the opportunity to enhance these techniques for future spill response and related damage assessments. A master list of oil spill response research projects conducted by BSEE at Ohmsett can be found on https://www.bsee.gov/what-we-do/oil-spill-preparedness/oil-spill-response-research/master-list-of-oil-spill-research.